Correct installation of J20 body mounts. I posted this query elsewhere with no response and have been advised to try this forum. The problem is that I've recently purchased new body mounts for my J20 and am unsure as to the best way to install. The parts I have comprise a traditional hockey puck and a "Michelin man midriff" that fit together with a bush. The Michelin man has a hex recess that is a good fit for a 5/8" nut. My current installation has a 7/16" bolt and a couple of ancient rubber mounts. I'm thinking that the best way to use the new mounts is with a section of all thread. Set a nut into the top mount and lock the top mount and hockey puck to the chassis. Then sit the body down onto the top mount and lightly lock down, possibly with a second nut. Re: Correct installation of J20 body mounts. Why use all-thread instead of the original bolts? If you can remove the bolts, they do not wear out. Just install them the way the factory did and you're done. Maine beekeeper's truck: '77 J10 LWB, 258/T15/D20/3.54 bone stock, low options (delete radio), PS/PDB, hubcaps. Thanks for the reply. Thing is, I'm not sure the current bolts are original. The new poly mounts have a 5/8" hole through them and a hex recess that's an nice fit for a 5/8" nut. I'm trying to figure how they are intended to go in. If I install as per the current arrangement, the mount with the hex recess in it simply gets sandwiched between the body and the chassis, so why did they go the trouble of putting a hex recess in it? There may be another application for them. But I cannot think of what it would be for on an FSJ. Use the original bolts. There's no better reference than this, other than the original truck. If this is an aftermarket package of mounts, different suppliers have more or less strict interpretation of applicability. If the parts are different from the original application, you will have to figure out how to use them, or reject them as not fitting. As I recall, there are no insulators between the truck bed and the frame. Mine has rubber isolators that are flat and square. They are about 1/4" thick. Many thanks for the manual extract. I can't refer to the part numbers as the whole mount has the same number, but that's much as I see it all going together, however, where is the cab in the diagram? 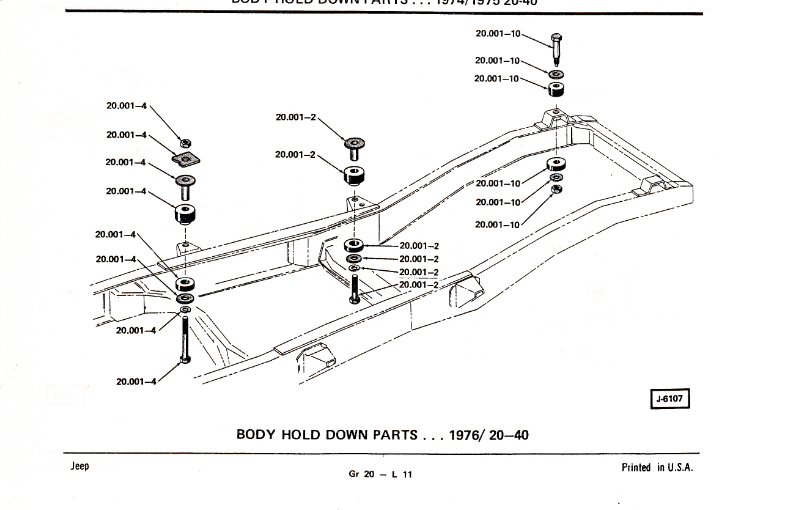 The drawing simply shows the arrangement of the mounts and the chassis. Looking at the centre mount in the diagram, is the top "mushroom", what the lower bolt screws into? If so, does the cab bolt down to this same mushroom from above? The alternative is that the bolt simply passes through the mount and the cab, before being secured by a nut and washer within the cab. Drawing shows the cab end of the frame. In the photo, left most and center are the cab mounts. The right most is the radiator support. Sorry, didn't make my question clear. I recognise the orientation of the chassis. My query is where does the cab fit in the sandwich of parts? Does it sit down on top of the parts shown? Sorry if this seems a silly question but all I currently have is a rubber block either side of the chassis mount, cab sitting on top, with a bolt through the lot and a nut and washer inside the cab. Interestingly, I've also got a 1968 Gladiator, and that has springs, much like a valve spring, inside the cab. The cab still sits on a rubber block but can lift off the chassis by compressing the spring. You understand that the frame outriggers are between the two rubber parts? For the rearmost mount, I would install with the nut and square washer inside the cab, and the rest underneath. At the center (front of the cab), the nut is in the cab and everything shown goes under the floor. At the core support (front), I'd expect the washer could go on top of, or underneath, the core support. It would depend on the design of the core support. You should be able to figure this out by looking at the parts and the location in the body. Think about the purpose of the washers. They either keep the bolt from pulling through the thin sheet metal, or they distribute the load over the whole rubber bushing. (I expect the washers with sleeves mostly keep the parts aligned during assembly, and possibly protect the rubber from movement of the cab.) If the core support at the mount is thin and broad, the washer goes on top of the thin body steel, and the body steel backed up by the washer distributes the load over the bushing. If the core support is narrow and rigid at the mount, the washer goes underneath the core support to distribute the load over the bushing. The numbers are not the part numbers. They point to the section and line in the parts listing. The part numbers are in the listings. I'm sure part numbers won't help you - nobody is now selling this stuff by its Jeep part numbers. Thanks, yes I do understand that the frame outriggers fit between the two rubber parts. You probably need to refer back to my original question. Possibly it would help if I mentioned that I've been messing with Jeeps for forty years now and do understand the normal ways that these things work. I am however puzzled by the new poly body mounts I recently received, with a hex rebate inside the mount that I would normally place between the chassis and the body. There's obviously some manufacturing effort gone into creating a hex rebate and I'm wondering why. From an engineering perspective, the only reason I can see is to lock the mount solid to the chassis, whilst allowing the body to be attached to the mount without compressing it excessively. The drawings from the manual show a "mushroom" at the top. Does the body sit on top of this mushroom, or is the top of the mushroom inside the cab? What we mentioned above is typically these mounts have more than one application. This is especially true for FSJ's as there aren't many of us buying these. So the manufacturers find what they have that is close, and put those in the kit. I would not worry about it. Ah-ha, I see your point. I didn't realise it was a small market. Certainly is in Australia but I thought there'd still be heaps of FSJ's floating about the States. I'll get on and install these mounts. I'll tackle it in the spirit you suggest and not assume there is a correct way. Might end up just the same as now or I might incorporate some improvements. Thanks for the input.